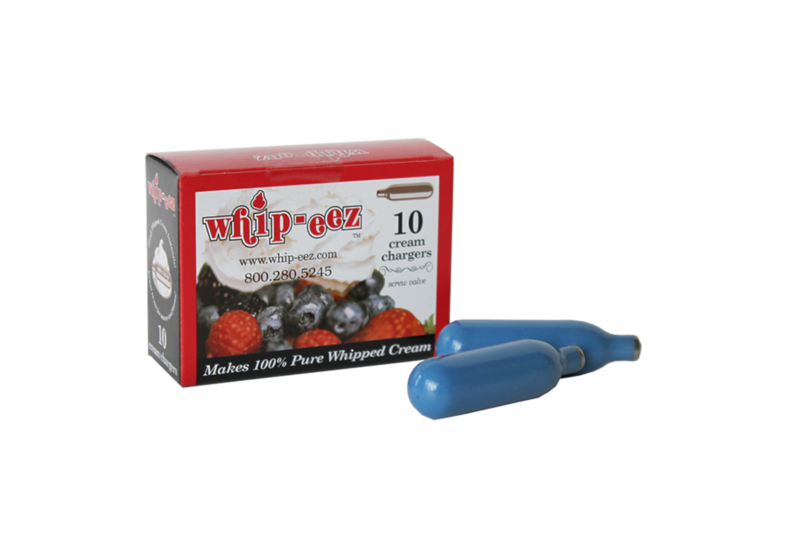 Whip-eez Brand is of the Highest Quality European Chargers Available- Pure Nitrous Oxide gas packaged in standard 8 gram N2o chargers. N2o (nitrous oxide) is a colorless non-flammable gas that is widely used as a propellant in the food industry. With its bacteriostatic properties (inhibits the growth of bacteria) and its slightly sweet odor, it is used worldwide as a food propellant especially in making Whipped Cream. Whip-eez brand nitrous oxide canisters are 100% compatible with all standard screw valve dispensers including iSi, Mosa, and Liss. These work great in my cream whipper. I love gadgets, so I bought a whipper here after seeing it in action at my mom’s house. I have purchased chargers from other websites and like to try a variety to find out for myself which is the best value for my money. I am pleased with the performance of these whip cream chargers and will definitely buy from here again. The price is great too! 30 chargers is exactly what I need. I use 1 charger every two weeks and these work great. This is a really good price with shipping included. Since I have bought here before I can say that the service is fast, friendly, and fantastic. I have told other friends about this website and your products. I am sure you guys will get more business. Thank you. Anna. I got a cream whipper for christmas and needed to purchase more chargers. I called to ask a few questions and bought 2 of these to check them out. Fast delivery time and they work very well. I’ll be purchasing a 100 case next time to save on shipping costs. I really like this company. Two thumbs up! Here is a REVIEW! This product is $10.00 cheaper than buying it local. Only one store in town carries the chargers, when they are out, your out of luck. I have always tried to support local, but, now I buy here. The product is great! Never had a cylinder fail. Now I will start buying the chargers for my daughters family too. The gas creates whipped cream in my canister. It works very good. I buy my chargers here because I know they work and with no problems. I did my homework and did a lot of investigating on what problems may occur and what to expect. Very pleased with the quality and fast delivery. I will buy from this website again. Whip-eez is really a good brand name. Bought this 10 pack, actually 2 of them, and I am pleased to inform any potential buyers that these met my expectations. All that I have read about “not oily” and “no duds” and “greatest nitrous on the planet” are true. My next purchase will be much more. Keep up the great chargers whipeez! Awesome deal! Happy with my entire order. Didn’t expect such quality for the price.